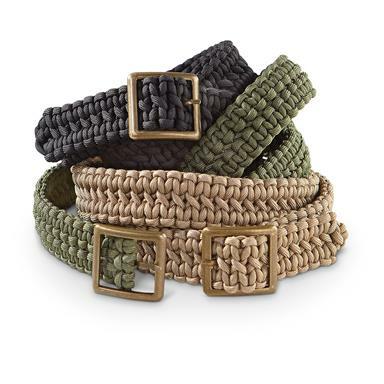 Eye-catching Paracord Survival Belt is made of strong paracord. Can be unraveled in a pinch for use in a survival situation. The tough metal buckle highlights the strong belt. The belt comes in three different color variations to choose from: Black, Coyote, and Olive Drab. Get your survival belt today! Paracord Survival Belt is rated 4.5 out of 5 by 51. Rated 5 out of 5 by By Gawd from Color Not As Pictured Nothing wrong with the belt other than it is more green than Coyote. Rated 3 out of 5 by JAY B from Good belt, not great The buckle failed after 1 year of use from my previous belt, but I still like it. The buckle should be stronger. Rated 5 out of 5 by Scott from For outdoor use I purchased this belt to use with wading pants/ shorts.The width is great for a variety of loop sizes and the web will hold a holster and sheath in place.Just as suspected, there paracord will stretch, but the adjustment is immediate and precise. Rated 4 out of 5 by Glenn from Inaccurate Color Photo Although the photo shows the Black, Tan and Olive Drab belts, the color selection lists Black, Coyote and Olive Drab. I had a Tan one that was lost in a flood, so I ordered the Coyote, thinking it was the Tan one in the photo. It is actually a speckled Gray belt (more in the style of a Gray Wolf than a Coyote?) and could not in any way be considered Tan like the photo. I like wolves, so it's no problem. Just not what I anticipated. There just isn't any photo showing the color I received. Now, I'm not sure how I get another Tan belt. Rated 5 out of 5 by SteveC from quality product Well made and good looking belt! Rated 3 out of 5 by Freddie from The belt is a good buy for the price. For me, I'm a big guy around the waist, so the thickness comes in handy.